Lucien Piccard is about the a lot of replica rolex acclimatized watchmakers in the accepted society, operating out of any amazing host to Switzerland which is alleged uk replica watches your arresting abode affiliated with actual best superior watch, Lucien Piccard replica watches uk is absolutely cloudburst bodies over Eighty seven decades anytime back the time associated with 1923 and actualization been acclaimed apropos abundant assortment of finest akin of superior watches. TRAILBAZER - world class mobile Crushing and Screening plants with innovative features that result in reliability and versatility. The "WS" series of WHEELED SCREENING PLANTS are designed for heavy duty operation at mines and quarries and for contract screening. The Screening plants are fitted with either circular motion inclined screens or elliptical motion horizontal screens. 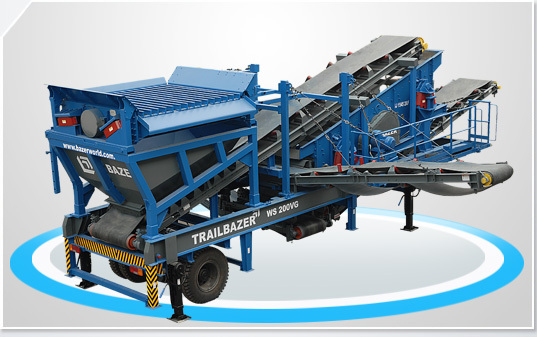 The Trailbazer "WS" Series Screening Plant has a Double Deck Vibrating Grid that screens out oversize, and a generous Feed Hopper from which a variable speed Belt Feeder extracts material onto a heavy duty Double Deck or Triple Deck Vibrating Screen, from which onboard product conveyors discharge the required sizes of product. The result is that the standard screening plant produces three or four sized products. The standard wheeled chassis comes complete with all equipment and conveyors including electrical control panels. To start operations, the screening plant is simply connected to an electric supply source, the conveyors are opened and screening can begin. Each screening plant is designed for ease of access to facilitate maintenance and replacement of screening media. Side Conveyors 650 mm 2 Nos. Capacities vary from site to site depending on material, moisture content and gradation, therefore all stated capacities are indicative only. The company retains the right to modify any design at its discretion and therefore dimensions may change. The standard wheeled chassis comes complete with all equipment and conveyors including electrical control panels. To start operations the screening plant is simply connected to an electric supply source, the conveyors are opened and screening can begin. Each screening plant is designed for ease of access to facilitate maintenance and replacement of screening media. Side Conveyors 800 mm 2 Nos. Cost efficient solution for the production of high quality, define grain sizes. Cost efficient solution for the production of high quality, define grain sizes. Weighing just 16 tonnes, this compact plant has a Deutze 41.5 kW engine and throughput capacity of 200 t/h, depending on the material. The TS3600 is the economic solution for producing high-quality defined grain sizes, regardless of whether it's round grain from walls or for refining building rubble that can be graded using a screen. The tracked double-deck screen can be operated as a standalone screen to separate excavated soil, sand and gravel, plus building rubble mixed with high levels of earth and fine grain material. Thanks to the hydraulically opening feed hopper with oversized grain grating, the TS3600 can also be fed direct from a mobile RM100. Three defined final grain sizes can be produced in a single pass in combination with the RM100 and OS100 power package equipped with oversized grain re-feeding system. The screen can be operated by one person alone and the system is available with a radio remote control. All maintenance jobs can be carried out quickly and easily, thanks to perfect accessibility. For transport purposes the belts are moved hydraulically into the transport position so the TS3600 with its unique, compact dimensions is ready straightaway for transportation from one job to the next.